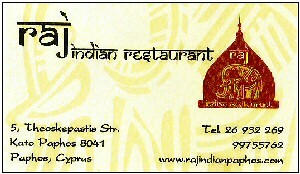 Finding a great Indian restaurant in Cyprus is not that easy. There are a lot of mediocre places in Paphos where the Indian food on offer tastes more like a vesta curry (if you're old enough to remember those horrid packet mixes!) or you're just given bits of un-marinated meat in a gloopy spicy gravy. The RAJ restaurant in Kato Paphos is a complete revelation. At last we have a great authentic Indian restaurant in the Paphos area where the food and service lives up to its reputation. We tried it for the first time last night and ordered a selection of starters and main courses to share between four of us. We even shared a soup dish (the owner kindly gave us tiny bowls so we could all sample it!) then all wished we had ordered more of it, it was so good - a dahl lentil soup with lamb and delectable spices. All the dishes ordered were superb from the onion bhajis and chicken tikka starters through to the main courses of lamb shaslick, chicken balti, lamb kharahi and one of the house specials, a mouthwatering concoction of delicately spiced chicken in a creamy yet fiery rich sauce. All washed down with garlic naan, rice and Indian beer of course. We will definately be visiting the Raj on a regular basis even though we live 45 minutes away in Polis, especially as we now have a VIP card for the restaurant! Try it for yourself, you won't be disappointed. If you love a really a good Indian meal then this is as good as it gets. We have eaten curries all over the Far East, Thailand, Malaysia, Hong Kong and in the UK and we always have two or three meals at the Raj on our regular visits to Paphos. Great food and a very charming host. If he doesn't mind us saying so, Raj is a first class host and a lovely guy and his staff are great and always very helpful. Go from strenth to strenth friend Raj and we will see you again in October. Jenny and Geoff from Birchington UK. I love Indian food and as we don't have an Indian restuarant in Polis yet this sounds like one to put at the top of the list for our next meal out. Join in and write your own page! It's easy to do. How? Simply click here to return to Best Cyprus Restaurant.